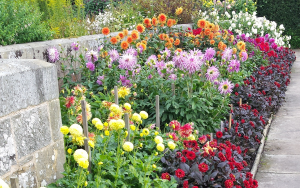 You have reached the website for Godstone Gardeners – a well-established club that meet monthly in the Surrey village of Godstone. Welcome – whether you have landed via a Google search, or are a local new to the area or simply new to gardening. You may, of course, even be a paid-up member venturing on to remind yourself what we are doing when or in search of Alex’s authentic recipe for gazpacho! Thanks to the power of the internet, anyone in the world is free to browse our archive of recipes for making the most of home-grown produce or take a look at our members’ gallery of garden visits. You can also sign up for our email newsletters but by far the best way to get involved is to live nearby so you can join us in person. We meet in the White Hart Barn, opposite the village green on the first Wednesday of every month from 7:45pm until about 9.30pm. You will find more details of the speakers, events and trips we have lined up for this year on the website and in our monthly email newsletters. The club is open to everyone, no matter what their gardening ability. Come along and try us out for an evening for just £3 and, if you like what you see and hear, thereafter an annual £10 makes you an official Godstone Gardener! This site it the property of Godstone Gardeners' Club. All photographs and text on the site are copyright and must not be copied without the prior written permission of a club official.